I have three dogs and a cat but have a weakness for puppies, especially Border Collie puppies. Early today I received a phone call from a dog training friend. 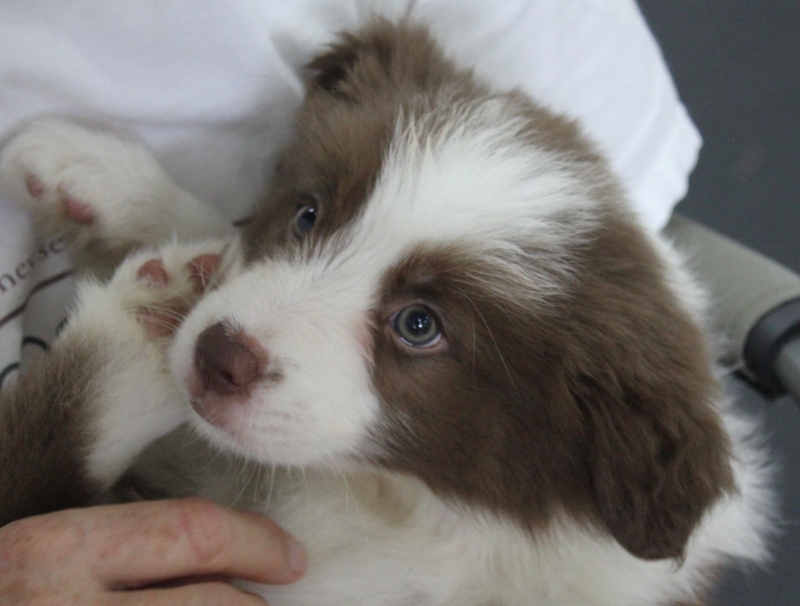 Could a local (FL) Border Collie breeder rent my building for a couple of hours so my friend could temperament test her young puppies? I said yes but felt a twinge of anxiety. I have three dogs and a cat but have a weakness for puppies, especially Border Collie puppies. Could I be an observer only and not purchase a puppy? This was going to take willpower. The breeder arrived later that day with my friend who had never seen the litter and could evaluate them as an unbiased temperament tester. Temperament tests are typically done on seven to eight week old puppies as a way to match their emerging personalities and behavior traits to the best new homes. It is not an exact science since environment and training will contribute to a puppy’s behavior as it grows. But at least by testing for such things as a pup’s reaction to loud noises, being held in different positions, playing with toys, etc. the breeder can tell a future owner which puppy will be the best fit for the work the dog will be asked to perform. It gives a clue, for example, as to whether the puppy is independent, smart, willful, scared, hesitant, noisy, quiet or high energy. This testing, combined with the time the breeder has spent with the pups, gives a good picture of each dog’s potential. The five whining, squirming balls of fur were taken from the big plastic crate and put into a wire exercise pen. They weren’t the usual black and white Border Collies. Out of the crate emerged a male chocolate merle, a male blue merle, a sable male and two chocolate (also called red) and white females. My eyes filled with tears when I saw the red and white puppies. My beloved red and white Border Collie died of cancer in October, 2012 at the age of ten. Someday, I vowed, I’d have another red Border Collie. 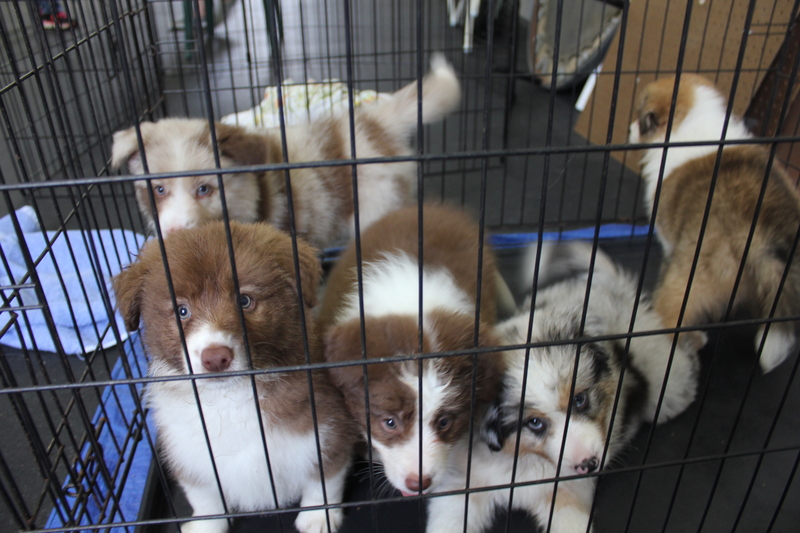 All of these puppies were spoken for, expect of course, with my luck, one red and white girl. The rational part of me was internally fighting the emotional/impulsive side. I don’t need four Border Collies versus remembering my beloved River and how I wanted him or his likeness back by my side. As my friend proceeded through the temperament test it became apparent that the red girl, who I had already named, would not be a good match for me. Finally emotion/impulse was losing to logic. Red girl did well but the test did what it’s intended to do. For my purposes two of the male puppies would have been a better pick for me. I need a puppy that can enter a home with older dogs and a cat, who is independent and smart but not too much, a people lover, very toy crazy, not the highest energy pup in the litter but close. I reminded myself that my future puppy should be a male since one female (you know the “B” word I’m thinking of), is enough for my household. The temperament test allowed my rational brain to gain control again. All puppies deserve one hundred percent of a new owner’s attention, which my eleven month old had last fall when she was a little ball of fur. I’m currently training two dogs. A third dog would be short-changed. Further, I told myself, I can never have River back and no dog needs to live in another dog’s shadow. The breeder drove away with the five puppies, one staying with her, two going to show homes, one to a herding home and the red girl is still for sale. I’m impressed with this woman’s breeding program and all the socializing and attention she has given the five energetic puppies. I’m impressed that she went the extra mile to do the temperament testing so the dogs can be matched with the best homes. For me, I like that she has a breeding line that throws red Border Collies. But not for now. For now, have a good life sweet red girl. 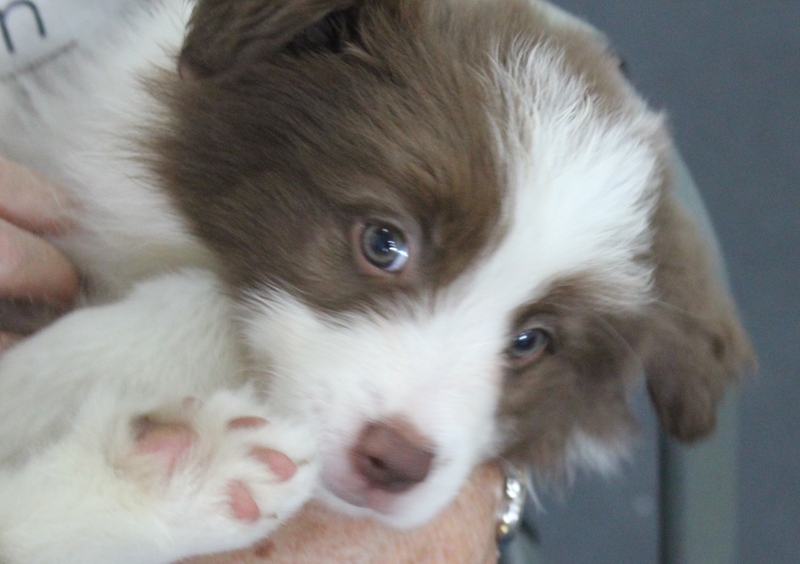 This entry was posted in border collies, Dog training, Dogs, Florida, Puppies, Retirement Life and tagged Border Collie, Border Collies, Dog, dog obedience, Florida, Pets, retired life. Bookmark the permalink.